Register for DDMO/MPACT Conference Now! Join us Friday, May 3, 2019, for a conference entitled “How to Improve Word-Level Reading in Students with Dyslexia” featuring David Kilpatrick, PhD and presented by Decoding Dyslexia MO in conjunction with MPACT Missouri Parents ACT. Implementation of the new Missouri state dyslexia law began this school year and additional legislation focused on evidence-based reading interventions has been filed in the legislature. 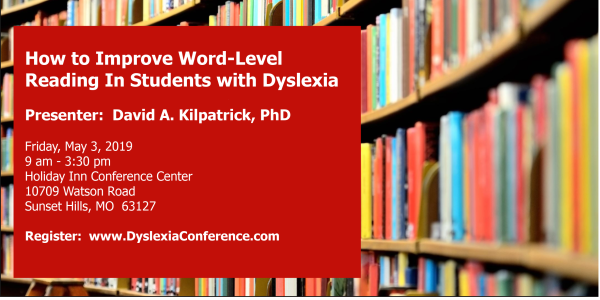 To support teachers, parents and other professionals in understanding dyslexia and other reading disabilities, David Kilpatrick, Ph.D. will present in St. Louis, Missouri on May 3. David’s book, Essentials of Assessing, Preventing, and Overcoming Reading Difficulties, is used by DESE and the RPDC Dyslexia Consultants as a source of information and study. The presentation will focus on how children learn to read words and why some children struggle. Understanding the nature of word-level reading development and word-level reading problems will guide both assessment and intervention. Studies consistently show that the most commonly used intervention approaches provide limited benefits for weak readers. 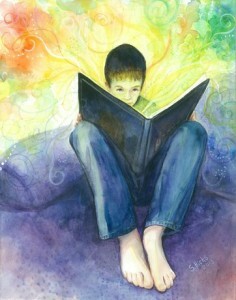 However, other studies have shown that some approaches can yield very large reading gains for such students. Once we understand how reading works and why some students struggle, the reasons for this pattern of intervention findings become clear. The focus is on establishing the best instructional and intervention practices. Thanks to the hard work of our members, Decoding Dyslexia-MO was successful in getting a screening, professional development, and accommodations bill passed. 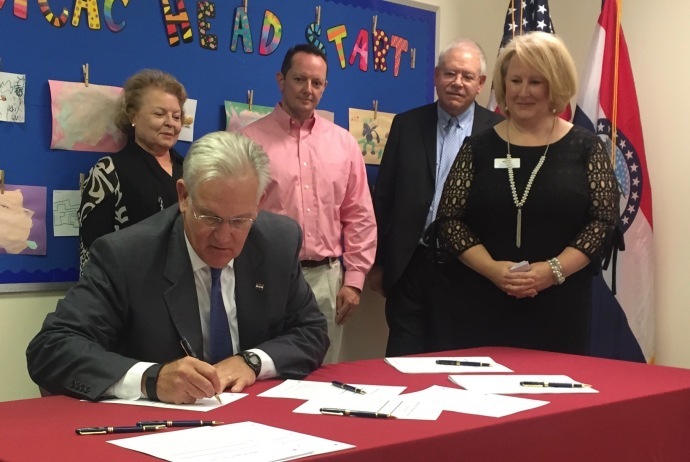 Governor Nixon signed House Bill 2379 and Senate Bill 638 on Wednesday, June 22, 2016 at 2pm in Springfield at the Ozarks Area Community Action Corporation (OACAC) Head Start location. This act requires the Department of Elementary and Secondary Education to develop guidelines for the appropriate screening of students for dyslexia and related disorders and to develop the necessary *classroom support for such students by December 31, 2017. Beginning in the 2018-19 school year, each public school including charter schools, shall conduct dyslexia screenings and provide reasonable classroom support consistent with the guidelines developed by the Department of Elementary and Secondary Education. Additionally, practicing teacher assistance programs shall include two hours of in-service training regarding dyslexia and related disorder provided by each school district for all practicing teachers. Such training shall count as two contact hours of professional development. 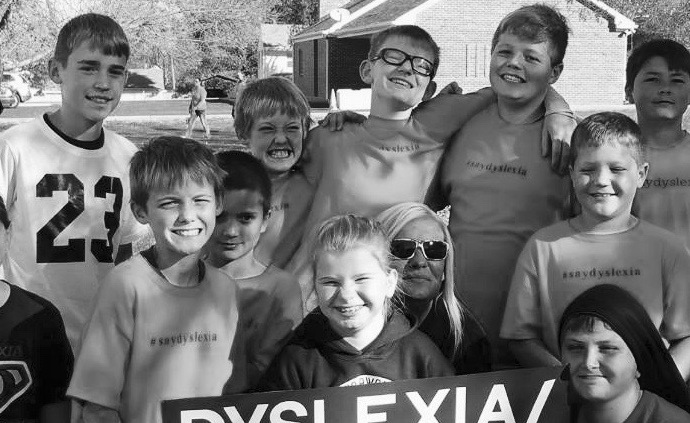 This act also created the Legislative Task Force on Dyslexia. The Task Force was required to advise and make recommendations to the Governor, Joint Committee on Education, and relevant state agencies. The Task Force consisted of twenty members, as described in the act. The Task Force published their recommendations for a statewide system for identification, intervention, and delivery of supports for students with dyslexia. The Task Force recommendations were published in October of 2017: Task Force Recommendations. In addition to working on this bill, DDMO members secured funding in the legislature for the Dyslexia Specialist position in the MO Dept. of Education. 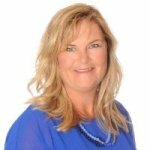 Kim Stuckey was hired as MO’s Dyslexia Specialist and she has established several initiatives in her position including professional development programs and a dyslexia webpage on the MO Dept. of Education’s website (MO Dept. of Ed Dyslexia webpage). DDMO also worked with the legislature and the Governor’s office to secure $250,000 for dyslexia professional development in MO. A large portion of this money is being allocated to dyslexia training programs at the Regional Professional Development Centers through the State. And NOW we are working on a bill that would create a “Reading Success Plan” (SB349) for any child reading below grade level. The “Reading Success Plan” would require intensive instruction in methods approved by the National Reading Panel and the International Dyslexia Association. These are tremendous steps forward for public school students in MO! *support is defined as “low-cost and effective best practices, such as oral examinations and extended test-taking periods, used to support students who have dyslexia or any related disorder”. 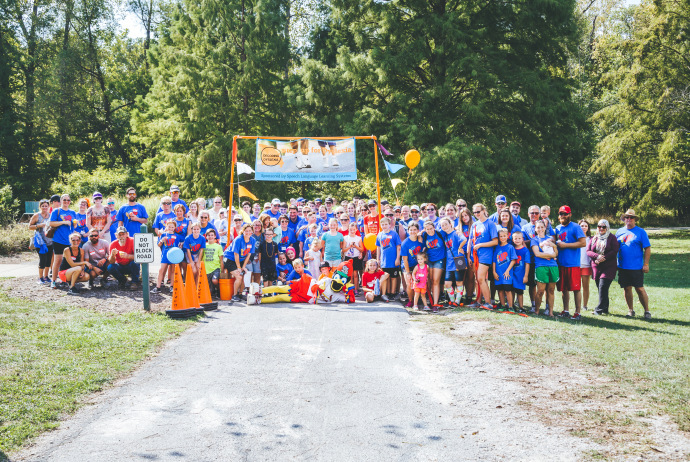 Thanks to everyone that joined us in 2017 for Step Up For Dyslexia. Please enjoy this video with highlights from the day. 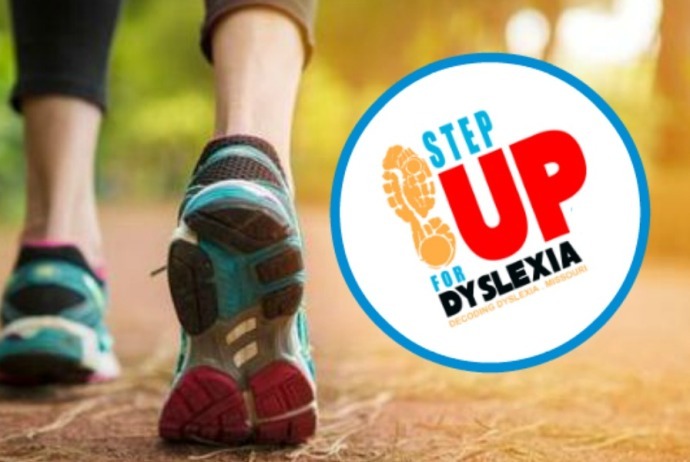 Be sure to mark your calendars for Sept 30, 2018 because we will be hosting Step Up For Dyslexia at Queeny Park again! Please get in touch with us if you would like to help plan next year’s event or if you would like to bring Step Up For Dyslexia to your city. You can reach us at info@decodingdyslexia-mo.org. We already have plans underway to host an educational event this spring that will help prepare parents and educators to be ready for the screening requirements that will roll out in fall of 2018. Funds raised at Step Up For Dyslexia will be used to help keep this event affordable. Stay tuned to our site for more detail. 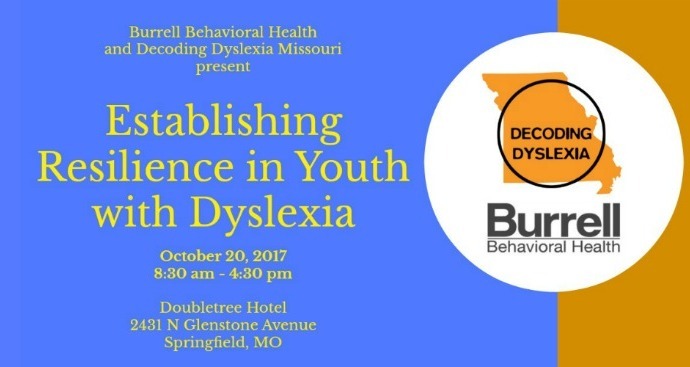 Join us Friday, October 20, 2017, for a conference entitled “Establishing Resilience in Youth with Dyslexia” presented by Decoding Dyslexia Missouri in conjunction with Burrell Behavioral Health in Springfield, MO. This daylong event of expert advice will address the identification and treatment of dyslexia where we explore not only how to strengthen early identification, treatment, and resources; but also how to focus on building strengths and resilience. Our national experts will provide information designed to guide the assessment of dyslexia and reading disorders, explore technology supports, as well as provide expert advice on building resilience in youth struggling with dyslexia. Parents of Dyslexic students will benefit from the information and strategies discussed, as the conference will provide an enhanced understanding of current trends and advocacy for their children. Registration is $39 for teachers and professionals, $29 for Students or Parents of a dyslexic child. Seating is limited, so register early here to attend. Traveling from out of town? We have special room rates for the conference. Please see details on the registration page. 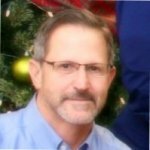 Dr. Sandman-Hurley, author of “The Dyslexia Advocate” and co-founder of The Dyslexia Training Institute, will be providing an overview of what dyslexia is, and what it is not. Dyslexia is not a gift. It just isn’t. Students with dyslexia are not going to be successful, creative geniuses because they are dyslexic. They are going to be successful, creative geniuses because they are resilient, have support from community and family, are smart, and like the rest of us found something they love. The books written about those who are uber successful have super-supportive families or someone in their life who took an interest. You may be that person. Throughout the day Dr. Sandman-Hurley will describe what dyslexia is – from symptoms to challenges, to interventions, and finally to building the characteristics that lead to resilience. She will also provide an introduction to teaching the structure of the English language. This session will discuss technology accommodations for students with Dyslexia in the classroom. Alternative text access for reading and writing will be discussed including alternative educational materials (AEM) for students not on an IEP. In addition, we will discuss computers and tablets that can be used with software and apps to increase access to text and increase written production. This session will discuss the importance of teaching and encouraging children to have the ability to self-advocate in the classroom setting. Children need to know how to tell their story effectively and communicate their strengths as well as their challenges and how to ask for what they need to succeed from educators. practices to identify, remediate and support students with dyslexia in Missouri. children and adults with dyslexia in our community. All proceeds will be used to support parent and teacher education programs and to help our members continue their work in the legislature. Senator Sifton will share information about legislation and will read a Proclamation about dyslexia issued by Governor Parson. Enjoy last year’s pictures and video!! Representative Kathy Swan will share information about legislation and will read a Proclamation about dyslexia issued by Governor Parson. Donate Here To Support Decoding Dyslexia MO’s Mission to Educate, Advocate, and Legislate. And be sure to watch our video to learn more about dyslexia. 100% of proceeds will fund programs such as “Hill Day,” dyslexia simulations, movie screenings, and website expenses. Governor Jay Nixon signed HB 2379 in Springfield Missouri on June 22, 2016, effectively creating the Legislative Task Force on Dyslexia. The Task Force will advise and make recommendations to the Governor, Joint Committee on Education, and relevant state agencies for a statewide system for identification, intervention, and delivery of supports for students with dyslexia, as described in the act. The Task Force will consist of twenty one members, as described in the act. Except for four legislative members and the Commissioner of Education, the members will be appointed by the President Pro Tempore of the Senate and the Speaker of the House of Representatives. 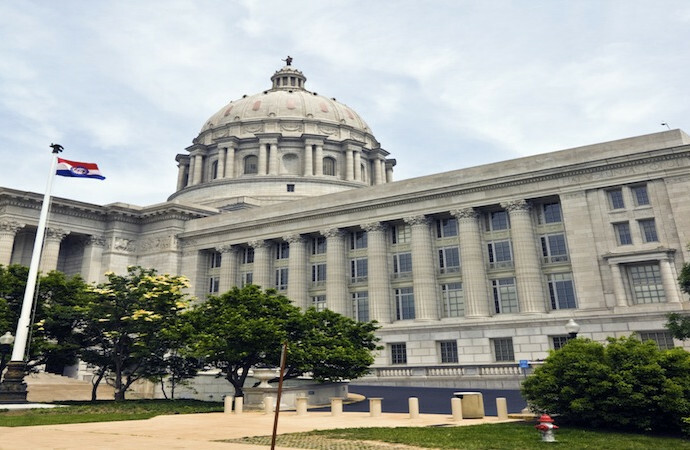 Names were submitted from across the State from stakeholders and state agencies for review by the Missouri legislature for appointments. The Senate released their list on August 31st and the House on September 7, which named the panel for the Task Force. Below is a list of appointments. Thanks to all of the DD-MO members that made passing HB2379 possible! Your hard work is beginning to pay off!! Learning disabilities, including reading disabilities, are commonly diagnosed in children. Their etiologies are multifactorial, reflecting genetic influences and dysfunction of brain systems. Learning disabilities are complex problems that require complex solutions. Early recognition and referral to qualified educational professionals for evidence-based evaluations and treatments seem necessary to achieve the best possible outcome. Most experts believe that dyslexia is a language-based disorder. Vision problems can interfere with the process of learning; however, vision problems are not the cause of primary dyslexia or learning disabilities. Scientific evidence does not support the efficacy of eye exercises, behavioral vision therapy, or special tinted filters or lenses for improving the long-term educational performance in these complex pediatric neurocognitive conditions. Diagnostic and treatment approaches that lack scientific evidence of efficacy, including eye exercises, behavioral vision therapy, or special tinted filters or lenses, are not endorsed and should not be recommended. independent teacher training programs accredited by the IDA. 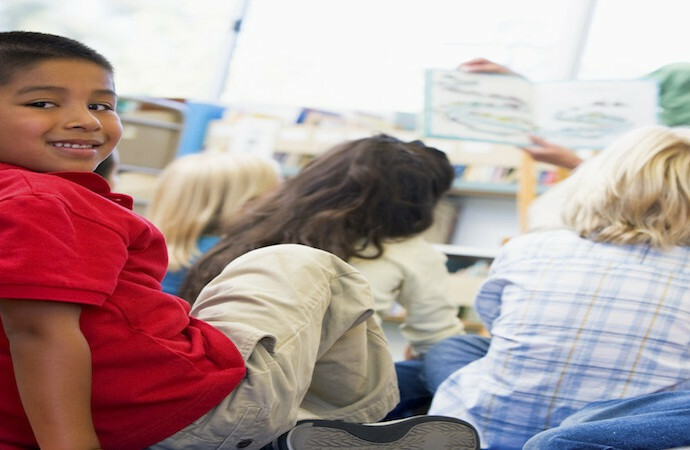 Reading Recovery: What Do School Districts Get For Their Money? Dyslexia and the New Science of Reading: this article appeared in Newsweek in November 1999 yet is still very relevant today. Wrightslaw Fifth grader is reading at 2.7 grade level. Should he be tested for Special Ed? It is official! Governor Nixon signed House Bill 2379 and Senate Bill 638 on Wednesday, June 22, 2016 at 2pm in Springfield at the Ozarks Area Community Action Corporation (OACAC) Head Start location at 552 N Stewart Avenue, Springfield, MO. There was a celebratory reception at 3:30pm hosted by the Springfield Center for Dyslexia and Learning located at 100 East Primrose St., Suite 530, Springfield, MO 65807. By December 31, 2017, this act requires the Department of Elementary and Secondary Education to develop guidelines for the appropriate screening of students for dyslexia and related disorders and to develop the necessary classroom support for such students. Beginning in the 2018-19 school year, each public school including charter schools, shall conduct dyslexia screenings and provide reasonable classroom support consistent with the guidelines developed by the Department of Elementary and Secondary Education. Additionally, practicing teacher assistance programs shall include two hours of in-service training regarding dyslexia and related disorder provided by each school district for all practicing teachers. Such training shall count as two contact hours of professional development. This act also creates the Legislative Task Force on Dyslexia. The Task Force will advise and make recommendations to the Governor, Joint Committee on Education, and relevant state agencies. The TAsk Force will consist of twenty members, as described in the act. Except for four legislative members and the Commissioner of Education, the members will be appointed by the President Pro Tempore of the Senate and the Speaker of the House of Representatives. The Task Force will make recommendations for a statewide system for identification, intervention, and delivery of supports for students with dyslexia, as described in the act. This is a tremendous step forward for public school students in MO!